One of the scariest aspects of freelancing is irregular income. Although I was financially prepared to leave my full time job, lack of income is my number one fear as a freelancer. Things seem like they are going well. I have clients and am hustling hard. Because I'm no longer receiving a steady paycheck, I've had to really start figuring how to plan for irregular income. Write down your income you are expecting for the month. 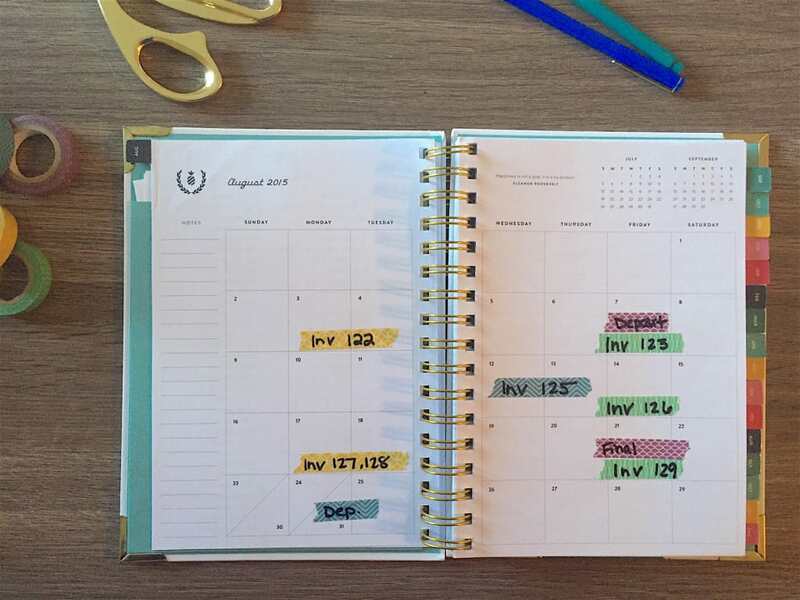 I use my Simplified Planner, my favorite pens in the world and fun washi tape to literally tape out when I can expect my invoices to be paid. The visual aid is so helpful and I can see when my income is due in a snap. Aside from a visual aid, I also use a spreadsheet so I know my fixed bills months ahead of time. I budget for necessary expenses, like wine groceries, pet food and oil changes. Being prepared has been a lifesaver. I like being able to look at any given month and know what my expenses will be, how much I will need, etc. When you receive a paycheck, immediately split it up into different bank accounts. I use Capital One 360 and have a handful of different bank accounts. I love this account because it's all online, there are ATM's everywhere and it's free. 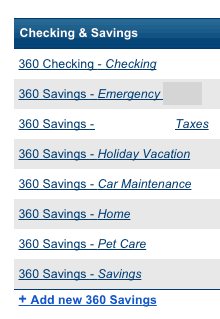 Originally Capital One 360 was my backup account, but now I use it full time. This seems like a lot of accounts, but I'm trying to put my money towards specific things. If extra money sits in my checking account there's a good chance I will spend it. My fun spending money is coming from a couple different areas that aren't all related to my pay checks. I'm still mystery shopping, doing panel studies and surveys. The side hustling never ends! Just say no to going out to dinner and all the extra things you want to be buy at Target. It's not easy, but eliminate the fluff in the beginning. If you're struggling to change your lifestyle, consider mystery shopping. I love mystery shopping because I get paid and reimbursed to go out to dinner, groceries, ordering a pizza in and shopping at big box stores. You might also want to consider panel studies, which you can learn about here. Ibotta is another free cell phone app. You use it after you go grocery shopping and use your receipt. It's basically a rebate app, so you can earn anywhere from 50 cents to $5 off everything you buy. My favorite part about this app is that it's not always brand specific, like a lot of coupons are. So you'll be able to scan “any brand of bread” for 50 cents off, etc. If you do coupon – you can STILL use Ibotta and get a rebate. For the diehard couponers out there, this will often result in getting an item for FREE. Crazy, right? If you want to grab the Ibotta app and start making money off your grocery receipts, click here to get started. You will receive a cash bonus of $10 when you scan your first item! Even if you have regular freelance clients, keep hustling. Seek out new clients, find new job boards and be open to trying new career paths. If a client asks you to expand your contract and cover new areas, why not try it? This could open new job opportunities that you might not have considered previously. Joining various Facebook group boards and reaching out to other bloggers has been a great way to make new contacts. Seek out local side hustles. My new apartment building has a ton of dogs. I've decided to start up my dog walking and pet sitting business again after getting approval from my property manager. I put up a sign in our community's dog park letting people know I work from home and am readily available. This has already resulted in a couple clients! If pet care isn't an option, look online at Craigslist for gigs or your local college job board. At most colleges, you can find graduate students using grant money to conduct research studies. Many times this grant money turns into compensation for people willing to participate in studies. Prior to quitting my job, I was financially prepared to start freelancing. Even with money tucked away, I don't want to spend it. Instead, I'm using the five tips above so I can budget as a freelancer. Do you worry about irregular income? I am just starting out freelancing also and these are all great tips. Can I ask how you found your niche for freelancing? I have heard several different things and I like your approach towards your freelancing business. Thanks! This is a helpful breakdown and could very well be applicable in my household budget as well. The irregularity of income is what scares be straight into the rat race of my current job. As much as I would love the flexibility of working from home for myself, I’m very comfortable knowing that whether I’m sick for a day or a week, as long as there is sick time, I’m going to get a regular pay check. I’m totally with you! Leaving my cozy salary has been a tough decision, but I am excited for what the future will bring! I like your new look of your website!! 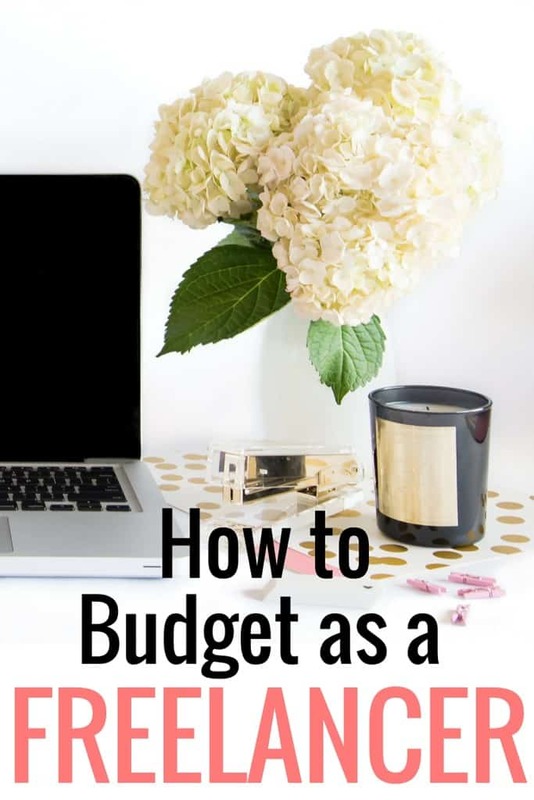 You hit the nail on the head with these tips for budgeting on a freelance budget! After freelancing for 10+ years, I would add one more tip… in the months where you make a lot, put some money aside for the months that are lean. Follow up with your invoices if they go past the due date (and charge an extra fee) to get your money promptly. Great points, that’s definitely one of the reason I haven’t quit my corporate job. I love my corporate job and it a stable income source for sure as well. However, I really enjoy running my online business as well. Currently it works great and is a great balance. However, as most of my income comes from consulting, then there is always a risk not having enough clients or what if the clients don’t pay on time, etc. On the same time, no one guarantees you the corporate job forever either. We just have to take risks and be prepared. Great point about corporate jobs – loyalty isn’t always rewarded! I definitely miss my steady paycheck! Great resource for freelancers. I’ve never been a full-time freelancer, but we do rely/plan for my side income and it’s important to have a cash reserve in case things change. I learned that the hard way when my biggest freelance client, FeeX, decided to go in a different direction and stop investing in their blog! I think having 100% of my income coming from freelancing would be tough for me. I like the stability of a regular paycheck and I tend to worry way too much. These are great tips though! These would be very helpful if I ever do decide to switch to 100% freelancing. Sounds like you’re pretty organized and hustling hard. I’m hoping that a full time situation is going to work out here in the next week or so! I think one of the best things from full time is knowing you’ll get paid at the same time, which has always been tough with freelancing. For instance right now I’m owed TONS of money, but until I get that, things are super lean once again. ugh!